Bell potty training is teaching your dog how to clearly let you know that he/she needs to go to the bathroom by ringing a bell that is near the door. This way if you are busy, or not paying attention, you dog can let you know audibly that you better let him out! This works very well for puppies who need to go to the bathroom quite often and cannot hold it, and for older dogs who need to go when they need to go! It it also handy for any household that is large and you will not necessarily see the dog sitting at the door. You start by making/finding the bells that you want. They should hang at or below the dogs nose height when standing, and should make a sound when just tapped. The kind of bell you use, how many, and how they are hung are all very important aspects of choosing which kind of bells will work best for your dog. Once you dog becomes more confident in ringing the bells, you can change out the bells for something a little more difficult to ring, but that have a more pleasant sound. Below is a break down of the most popular bell layouts, how to make them, and the pros and cons of each. 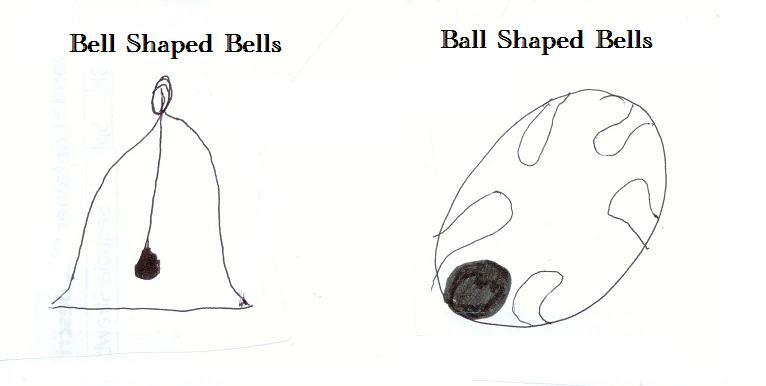 Left: Beginner bells for timid and not timid dogs. These were found in the Christmas decoration section of a department store and have lasted 5yrs. These are still my favorite bells since I have a timid dog in the house. 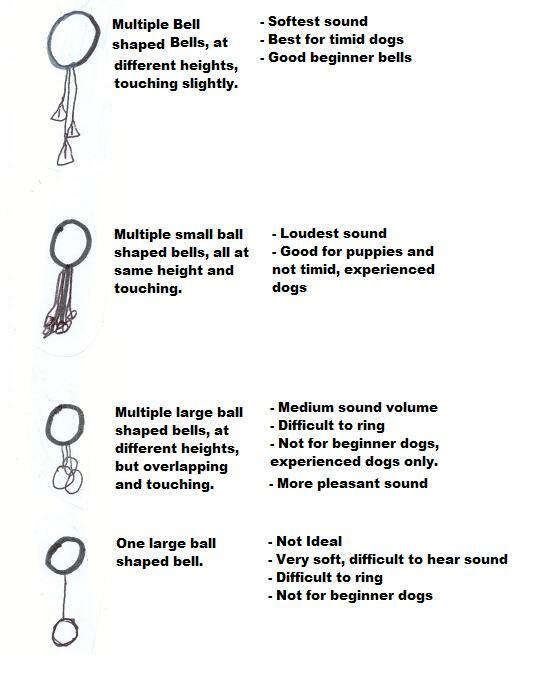 Once you have the bells you have decided will work best for your beginner dog, next you need to decide where to hang them. On the door handle (if you dog is not timid) of the door you use to let them outside is usually the easiest way. If you dog is timid, you will need to make them stationary right next to the door. Hanging the top ring on a nail on the wall works well. You need to be able to remove them without hassle for training. Now that you have the bells hung, it is time to get started training! Here is a video of the second time I asked Tristan to touch the bells to go outside. I let the other dogs out first so that I knew he wanted to go outside, then... (watch video). As you saw, I moved the bells towards him and he naturally "said hello" to it by touching it with his nose. Not all dogs will voluntarily "say hello" to it so easily, often more timid dogs will shy away. This is when you just make your hand smell like treats by rubbing a treat on it, then stick your hand behind the bells. Then when the dog touches the bell trying to get to your hand, you say yes and open the door. If you dog understands the word "YES" this training will go more quickly. If he doesn't, you just want to make the reaction of him touching the bells and opening the door as smoothly as possible. The video below is teaching a timid dog who does not understand "yes" to ring the bell. So, then every time you know your dog wants to go outside, you to to the door and wait for them to touch the bells- helping at first, then just waiting for it. The next video is of tristan's second try at ringing the bells, this is still his first night of bell training. I accidently pushed the "stop" button on the video camera right as he touched the bells instead of saying "yes"...I think I got it mixed up with a clicker, hehe. This is the third time ringing the bells. In the following days he just got faster and faster at going right up to the bells and ringing them. This was the last time I put the bells towards him. He rang the bell by himself on the third day while I just stood there pretending like I did not know what he wanted, until he rang it. THEN I said the "go potty?" words letting him know that "oh, now I know what you want".